Since the deadlines and nap strikes I've been having trouble finding my groove on my little space on the internet. I haven't been updating family with the oodles of pictures I do have on my camera and I haven't been sharing thoughts and moments and memories with words either. I'm sleepy. This state has remained the same. Linus is cutting incsiros and molars. It's a party. Every. Night. And, days are filled with quite the random tantrum as well as an insanely adorable smile and laugh. Bigfoot is still not struggling in the sleep department as well. It's been about a month and I'm still praying it's a phase. Nap times used to be my favorite. My absolute favorite because I was able to get in some quiet time to read, blog, exercise, or do nothing. Now? Not so much. I miss that little bit of time. We are settling more and more into our new home. We've been here for a little over two months now and I still could not be more happy with our home sweet home. The gift of our our home amazes me daily. I'm forever grateful. I spend time wishing I had skills I don't have. Such as: home decorating skills (Which sometimes I think I'd have them if I would just spend the money here and there to do the things that I have in my head, but I don't. ), planning skills, meal planning skills (are you seeing a trend here? ), super mom multitasking. And, the list goes on. Maybe if I set myself to do just one thing during these little wish dazes I might actually acquire a new skill. Oh, I won two giveaways!! Can you believe it? I can hardly believe it still! I won a beautiful Mother's Day giveaway through Kendra at Catholic All Year. Always Rosary provided a gorgeous rosary (photos to come in a post that I am hoping to get to soon!) and I won beautiful earrings through Jenna at Call Her Happy! Thank you, Thank you, Thank you!!! I have back pain. Like, major back pain. In the lower area. It's an old injury that has flared up over the years here and there, but much more frequently since Linus was born. Now, because of this back pain I have gotten myself an appointment with a chiropractor and could not be more thrilled. I need help. The back pain just makes my days so much harder and my nights much more restless than they already are with my two little night partying monkeys. Praying that I get results from these upcoming appointments! I love my husband. This isn't a new thing but it is something I have been doing lately. Not always to the best of my ability (Sorry, babe! ), but I do love him more than he'll ever know. 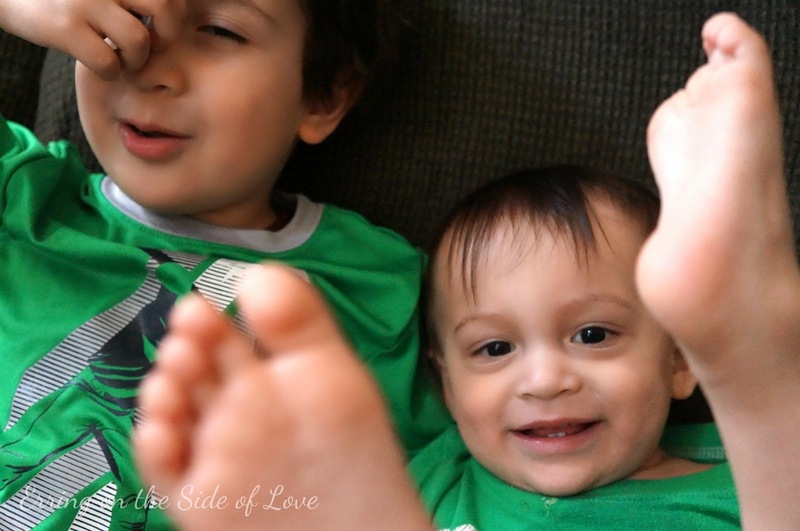 My boys make my heart happy in ways I never knew possible and I love them. Always and forever. So very much. Amen. I love to bake. Still. Lemonzest is happiness in my nose. and mouth. I saw Mom's Night Out and absolutely loved it. In fact, I want to see it again. It was hilarious, sweet, and all things I could relate to. The great thing is, I think non-moms would enjoy it too. It was so stinkin' funny! I really want to see it again. It was good for my soul to watch it and to laugh so hard. So, if you haven't seen it yet, GO SEE IT ASAP! I love my friends. I am so grateful for them. Really really! I'm going to EDEL! And, CANNOT WAIT! Speaking of, I finished reading Something Other Than God. It was amazing! I loved every bit of it! If you haven't read it, you must! During every spare moment this past month I have been reading that or The Little Oratory: A Beginner's Guide to Praying in the Home. Both of these books have been amazing and good for my soul that longs for Him in my day-to-day. I love our family. Parents, grandparents, aunts, uncles, cousins, etc etc etc They are all amazing and I'm grateful. We went to The Lot for my husband's company party. It was amazing! We had such a great time and it was perfect fun for the boys. Imagine three ginormous sand lots surrounded by tables. So. Much. Fun! If you're ever in the Dallas area, go there! It's JuNe! Our little Junebug/Bigfoot/Oldest was born! We'll be celebrating him towards the end of the month (which reminds me, I have yet to make that EVITE for his little birthday celebration). Oye! Either way, I'm excited to celebrate and remember all things wonderful about my soon to be three year old! Babies! Friends have been having babies galore and I am loving it! I went and had margaritas with my neighbor after our kiddos were down for the night. Best night out in a long time! Loved it and love her! So very grateful to have such a sweet neighbor that I can enjoy this tough gig called motherhood - during the day at the park and out in the evening for drinks. Fun times are ahead and I'm grateful! I have been updating here and there (definitely more often than the blog lately) on Instagram. So if you are on there, look for me! We've had lots of park days. No library days. A handful of daily Masses (which I would love to do more of). Patio days. Popsicle evenings with a side of basketball. All in all, we're still treading but it's getting much calmer. The fact that I was able to coherently jot a few of our recent to-dos is major progress for me. Thanks Jenna for this great link-up! And, thank you for stopping by and for any prayers ya'll are sending our way! The monkeys from the archive. Who are you? Me?? I swear I could have wrote so much of this list! I can't wait to meet you at Edel, and I hope you love your earrings! Thank you for linking up with me, friend! I, too, am surrounded by friends' babies. Well, most of them are not born yet, so it's mostly like being surrounded by pregnant women. Little different. 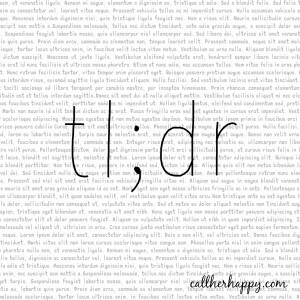 Glad to meet you through tl;dr!